Argo directed and starring Ben Affleck may be an odd pick for a Mousey Movie, but it is Mousey through and through despite being released by Warner Brothers. Sure, there are no cartoon animals, no plots full of gags, and I would not show it to the Between Tween because I think she would miss the historical contexts. But Argo has numerous ties to the House of Mouse and they cannot be ignored. In fact Sully (John Goodman) and Father in Law Christmas (Alan Arkin) both have significant roles and tie into some of my favorite Disney franchises. Argo recounts the story of Central Intelligence Agency agent Tony Menedez, played by Affleck, and his efforts to lead six United States Embassy employees out of Tehran, Iran during the Iranian Hostage Crisis in 1979. The six had fled the embassy and were in hiding at the Canadian Embassy. Menedez works with contacts in Hollywood to stage the production of a fake movie, Argo, so Mendez can spirit them out of the country as Canadian production staff. The movie is full of tension as the audience worries if Mendez and the six passengers will make it out of the country safely. You know as I think about it, this movie is really in the mold of Disney movies. There is some violence, but Menedez’s strained relationship with his family is highlighted along with his desire to be closer to them. He easily could be the dad in a PG movie fighting the balance of work and family. And the action and escape plot kind of reminds me of Touchstone’s (which means Disney’s) 1988 film The Rescue, a film in which teenagers save their Navy SEAL fathers from North Korean captivity, a film that was introduced to by Uncle Mike on The Wonderful World of Disney (or whatever version existed at the time). Action Hero: So Ben Affleck really does not have typical “Disney” credentials. But Disney has other labels they release films through. 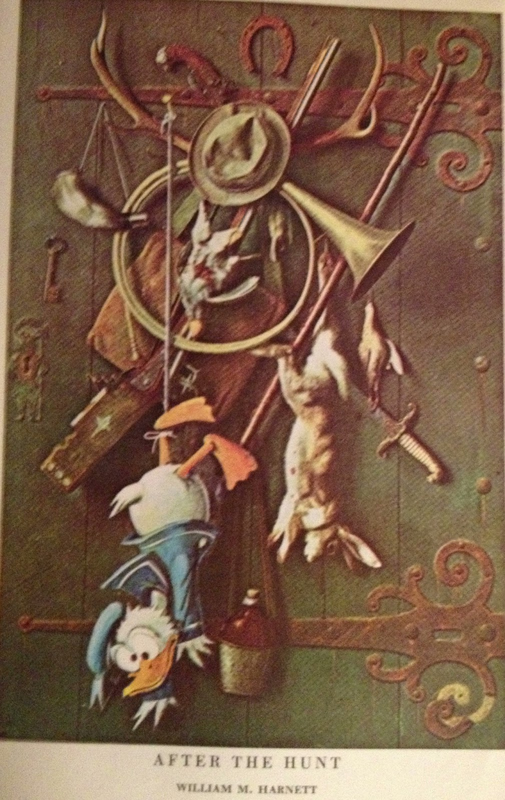 Touchstone Pictures was established by Disney in 1984 for the release of more mature films. Affleck has appeared in two mega-hits for Touchstone. These hits were 1998’s Armageddon and 2001’s Pearl Harbor. When I rode The Studio Backlot Tour at Disney-MGM Studios (yeah, it’s been that long), it was Pearl Harbor that was plastered throughout the attraction. Both of these films were produced by Jerry Bruckheimer, who now makes movies with the Disney label and makes buckets and buckets of money for the mouse. Disney actually helped Affleck in his big break. Affleck won an Academy Award for Best Writing (Original Screenplay) with Matt Damon for 1997’s Good Will Hunting which was distributed by Miramax Films. Disney owned Miramax from 1993 to 2010, which they purchased as a studio to produce independent minded films with an adult edge. Affleck would later appear in Miramax’s 1998 Shakespeare in Love, which won the Academy Award for best picture, which I am still angry about today since Saving Private Ryan was clearly the better movie. 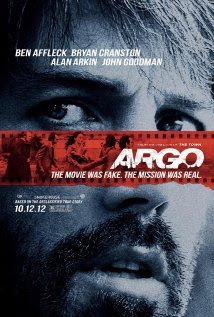 Plush: Menedez’s fake movie Argo is targeted due to the success of Star Wars. Basically everyone is trying to copy that success, including the CIA. Of course Disney itself tried to grab the coattails of Lucas’ success by offering up the underrated The Black Hole. The fact that Argo is a Star Wars rip off is clear at a table read which includes a character that can only be described as Purple Chewbacca! The impact of Star Wars goes past Purple Chewy, as Menedez’s son has a collection of Star Wars action figures that I am quite jealous of. Even as a grown adult I would really love his X-Wing, Millennium Falcon and the tall Boba Fett we see out of boxes in his bedroom! Crossroads: When you visit Disney’s Hollywood Studios the Imagineers want to put you into Hollywood even though you are in Florida. To set the scene they use a number of Los Angeles’ landmarks to set the scene. 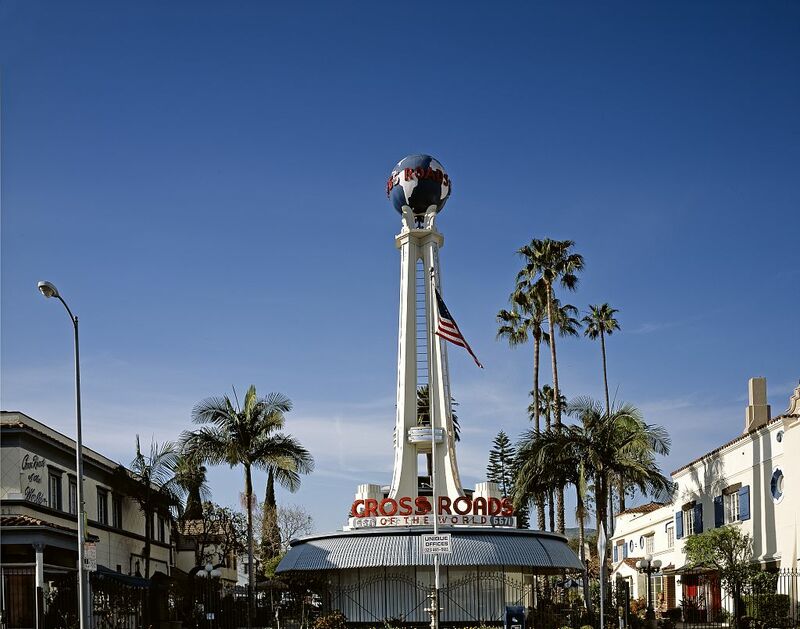 One of these is a replica of the Crossroads of the World, which some claim is the world’s first shopping mall. The icon is a tower with a spinning glob on top and is found inside the entrance to the theme park. In Argo the icon can be seen as Mendez and his producing partner Lester Siegel, played by Alan Arkin, attempt to purchase the Argo script. Old Guys: Of course a plan this crazy requires approval. So Menedez and his boss played by Bryan Cranston report to two senior CIA executives to get approval for them to kickoff their Hollywood plan. Cranston notes, “It’s like talking to the old guys on the Muppets.” The pair clearly are grumpy old men. Tough Security: Anyone who has flown to Anaheim and Orlando knows that security can be strict. Ironically during the time period that Argo covers, airport security was less strict with friends and family visiting passengers at the gate. If you want to see tough security, you have to check out the multiple checks at the Tehran Airport as Menedez attempts to bring his passengers out of Tehran. Once when a TSA agent at John Wayne grilled my kids I thought it odd, but I appreciated that he was confirming they were who I said they were. But Argo makes it clear that security in today’s America is a lot more convenient than revolutionary Iran. Argo is a great movie, and I would be more than happy to let Affleck participate in the Marvel or Star Wars universes after this fantastic offering. I look forward to seeing Affleck’s next project, which is not scheduled for Disney but Warner Brothers. But hopefully it will be just as Mousey and as entertaining as Argo. You know, the story that a small one man fighter destroyed the Death Star in Star Wars Episode IV: A New Hope sounds very suspicious when you start to think about it! A new short film, Luke's Change: an Inside Job, blows this conspircacy wide open! Clearly something suspicous occurred that day near Yavin! That's one magic X-Wing! And who can deny all of these connections to one family, who also represents the survivors of this incident. Seriously, I love this. I love that a fan put together a super smart Star Wars satire. I love the fact that it feels real world. 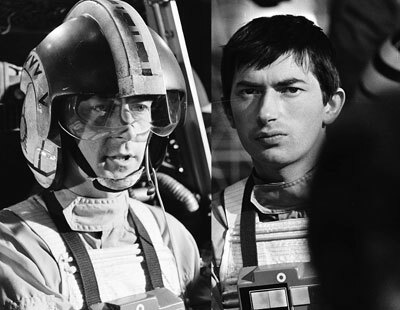 My only real complete is I know Wedge Antilles, and that sir is not Wedge Antilles! Will the real Wedge Stand Up? Part of the recent Star Wars announcement that included the cancellation of Star Wars: The Clone Wars was that Star Wars: Detours was on hold since Disney/Lucasfilm questioned if now was the best time to put out a humorous Star Wars project. I think Luke's Change proves if it is smart and actually funny, it's always a good time to laugh! Sometimes I worry that I might get labeled a Disney apologist. Maybe some of you might think I like everything with a Disney label on it. It’s not true. Sometimes if I don’t like it I simply do not waste words on it. 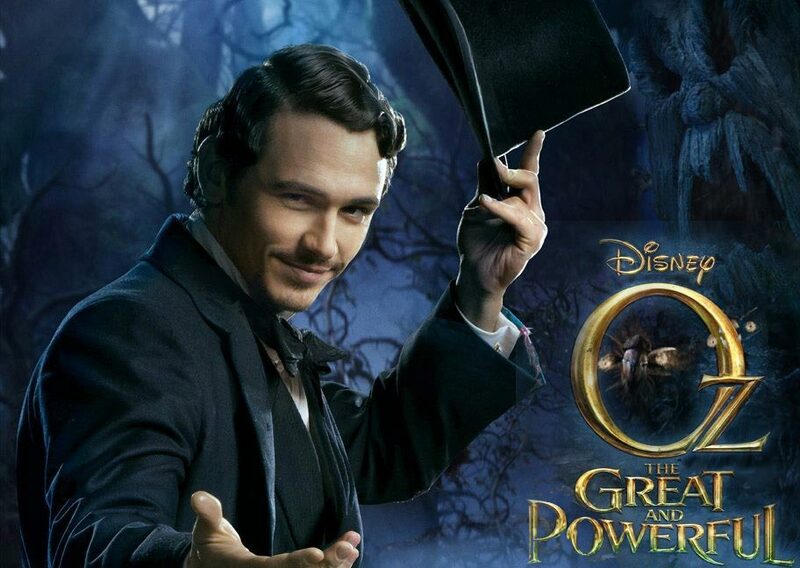 But with Oz the Great and Powerful, I feel since I have posted a few trailers I have to share my thoughts. Part of me thinks my thoughts do not matter on this issue. First, it is not like everyone agreed with my thoughts on last March’s movie John Carter. It’s not like I could save it. Second, since Oz the Great and Powerful has now dominated two weekend box offices I know my words will fall on deaf ears. But nonetheless just let me lay out my Mousey Movie Review of the latest visit to Oz. Leading Men: John Franco playing Oz has a tough mountain to climb. Let us be honest, two men currently define the Disney leading man. First you have Johnny Depp who crushed two Marches ago with Alice in Wonderland. Second, you have Robert Downey Jr., who could bring emotion and character to paint drying. Franco simply does not match up to these high standards. At times I felt like I could tell that he was delivering lines in stale green screen sets. I just never fully bought him as Oz. Additionally, the writing behind the magician turned Wizard does not help. The writers never provide Oz with the true turn around in his character. He is just as flawed when the movie is over then when it begins. Strange Looks: The CGI also does not help the movie. Yes there are plenty of breathtaking backgrounds. But some of those seem blurry and fake at times. Additionally the matching of live action to computer-animated images is poor. In one scene as the Wizard was holding China Girl you can see a gap between the fragile youngster and Oz’s hand. It simply does not always look right. Flying Monkeys: The best part of Oz the Great and Powerful is Finley the flying monkey voiced by Zach Braff. Finley amongst all of the characters is the most “real” and dare I say human. He is loyal, compassionate, funny, faithful, realistic, and warm. The fact that Finley has the best showing makes me sad since he is a CGI character with a voice over. Yet Braff seems to do a better job conveying emotion with just his voice where many of those around him fail with their entire selves. Fantasy Faire: In many ways I felt like Oz was a secondary character. To me the interesting characters were the witches Theodora played by Mila Kunis, Evanora played by Rachel Wiesz and Glenda played by Michelle Williams. 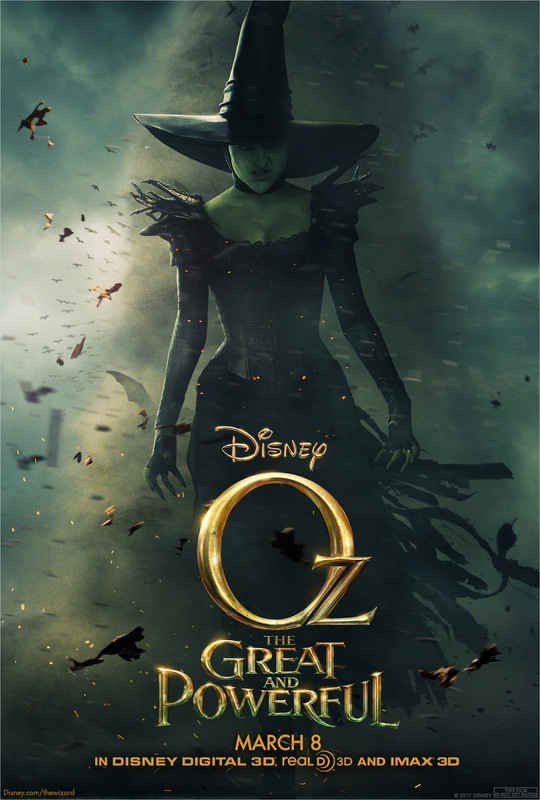 Despite the fact that Oz is the one they state will bring the prophecy to free Oz from evil about, it really feels like the women are driving the action. Honestly, the battle for Oz feels like it could have been waged without the male lead. Dark Ride: Oz’s arrival in Oz may have been one of the best moments to me. His journey through the river in his balloon feels like it could be a dark ride. Imagineers could easily craft an attraction that is part Alice in Wonderland at Disneyland and part Peter Pan’s Flight to offer us something really wonderful. Sadly, a 4-minute ride may do a better job depicting this story to its audience! I am not the only one that saw this as the Between Kid yelled out, “I would ride this”. White Elephant Gifts: The Between Wife changed her status after the movie to “The Wizard gives the worst gifts ever.” In the original MGM Wizard of Oz we have a gift scene in which objects represent something bigger like brains, heart, and courage. Here we have a similar gift scene, but the gifts really do not have a label that indentifies a bigger idea. For example, one gift could be labeled joy or happiness. Instead, the Wizard just basically says it is something that everybody could use sometimes and gives it to a grumpy character. Please Wizard, try harder when you shop! Bookends: This offering clearly pays tribute to the MGM classic The Wizard of Oz. 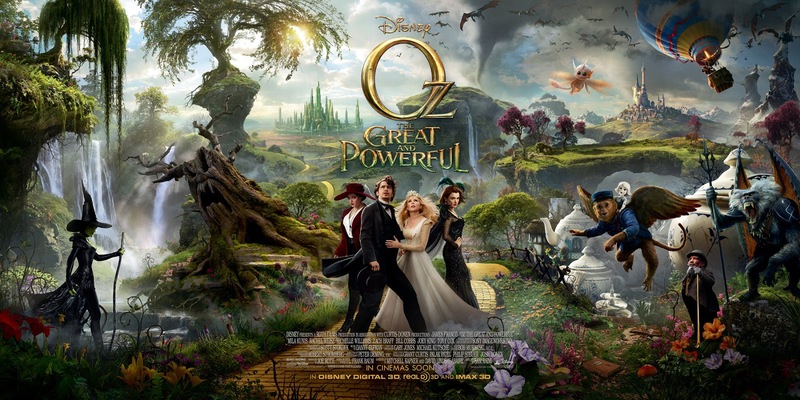 Like this classic film, Oz the Great and Powerful opens in black and white and in Kansas. We see Oz’s problems in our world and he makes some mistakes in his relationships. In the original, we return to Kansas and we get those storylines wrapped up in a little bow. Here, not at all. In my mind, we got 3/4ths of a movie. And the fact that Oz really does not reform much just helps push that impression. There are some really cute things here, like Oz working for the Baum Brothers Circus a tribute to Wizard of Oz creator L. Frank Baum. And I was pretty excited to see Oz the Great and Powerful. 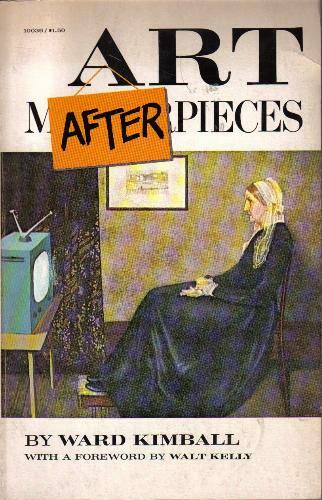 But for me it feel flat, felt slow and had numerous story problems. With a sequel confirmed, I have already made my viewing plans for the next installment. 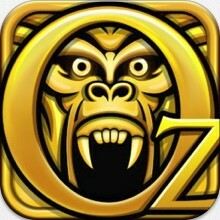 I will be renting the next Oz film! Do you agree? When the Between Family first visited the Disneyland Resort we picked up a DVD in Adventureland that I have not seen since. Disneyland Resort: Remember the Moments a Magical Souvenir provides a glimpse of the full resort including Disneyland Park, Disney’s California Adventure (DCA) as it was named at that time, Downtown Disney and the Disney hotels. Our tour guides Karen and Mile provide a land by land, park by park tour of the Disneyland resort with video and narration highlighting the attractions and features of the park. Additionally, facts about the current topic of discuss graphically pop onto the screen as the video plays. Honestly, it is a pretty straight forward promotional tour of the park. And this fact can somewhat be found in the special features which includes “Making the Video Guide”, “The Twilight Tower of Terror Time Lapse”, “Two Great Shows” which provides information about the Snow White and Aladdin stage shows, and “Traveling with Preschoolers”. Many of these would be useful to someone planning a trip. The presentation is set around 2005. There are references to the Disneyland 50th anniversary, the Parade of the Stars which ran from 1999 to 2005, and Snow White an Enchanting Musical which ran from 2004 to 2006. For me this is a Disneyland that I never saw, despite that fact that it is relatively modern. For me that most interesting portion of the video is Disney’s California Adventure still in its youth. With a Sun Wheel, the Orange Stinger and the Maliboomer all prominently featured, it show me how much DCA has changed and greatly improved. It is amazing how quickly this park has matured. I do not know if I would advocate purchasing this video. We picked it up in the park for a reasonable price and do not know if it is still available. A search on Amazon uncovered copies for $50. Now I will admit that the Between Kid really likes this title. But he likes it just as much as the most current Disney Parks Planning video, which is free. The value in trip planning is also limited since it almost a decade old. So, as much as I enjoy the early DCA video, financially I would not spend a lot on this window to the past. 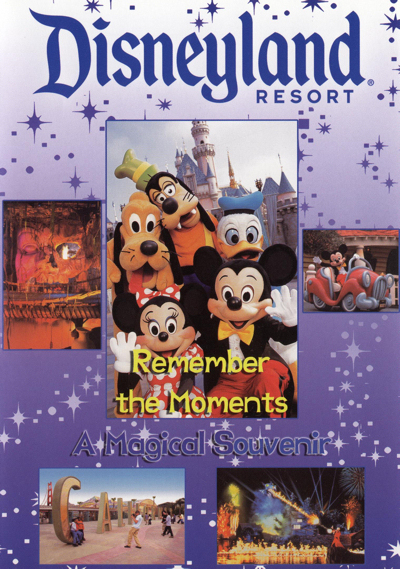 Disneyland Resort: Remember the Moments a Magical Souvenir provides a peak at Disneyland in the years before I visited. I am sure for many of you, you remember this Disneyland Resort well. Viewing this again and again and again over the last three years has helped remind me that these parks do change quickly and for some of us a window looking a few years back is the only way we will see an era of the parks. Several months ago I was emailing with publisher Leonard Kinsey discussing a review copy that he was sending to me. I felt bad because I noted I did not want to review his first fiction offering, Our Kingdom of Dust. I said no for two reasons. First, I did not feel comfortable reviewing fiction at that time. Second, the subject matter just did not feel like a good fit for me. But despite the fact I wanted nothing to do with this title, I could not resist picking up a Kindle copy from Amazon due to the really affordable price and the fact that Leonard has been very kind to me, which made me want to check out what he had put together. Despite the fact that I had purchased it, it sat on my Kindle shelf for months. 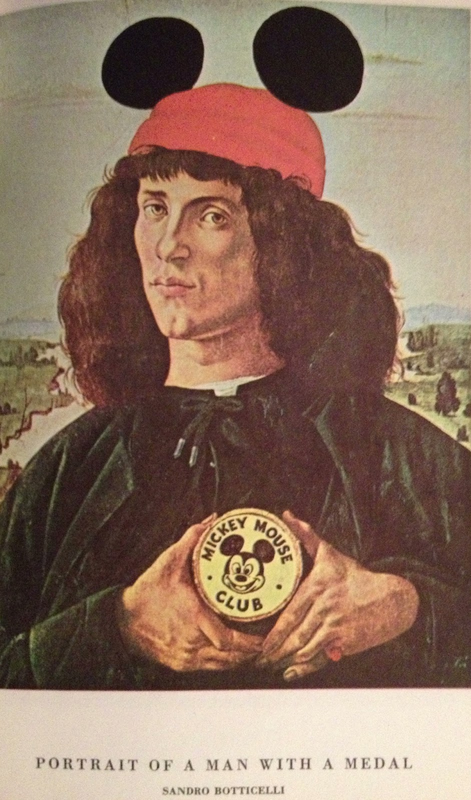 In the meantime, I enjoyed another Disney fictional story and some history, but I never cracked the virtual cover. Then I found myself on a family trip reading a fiction book in another genre and I found myself a little bored with that title. After this realization, I decided one morning to finally crack open Our Kingdom of Dust, even though I knew I would hate it! But, it would help pass the time until I was ready for the other book again. Several hours later, I found that I had finished the book and had not even considered Star Wars. 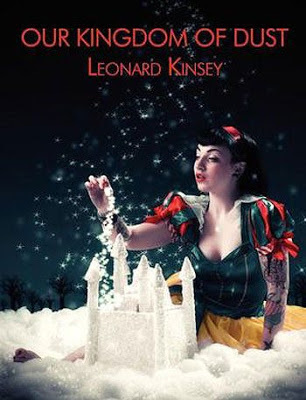 Well played Leonard Kinsey, well played! Our Kingdom of Dust follows the fictional Blaine McKinnon. Blaine had been successful in the business world, making his millions young. But on the personal front, his life could only be called tragic. After one last straw, McKinnon decides to take his fortune and retreat to the Walt Disney World Resort, a location filled with many happy childhood memories with his late parents. While holding up indefinitely at the Boardwalk, he befriends Jay, a tattooed Disney superfan (I mention the tattoos only because they are all Disney themed) and drug dealer. Blaine, who has not been lucky in love, falls for Jay’s girlfriend Lisa, who is a friend of Snow White. Through Jay and Lisa, Blaine enters a world of deeply broken people who use Jay’s custom drug, Pixie Dust. Pixie Dust does what all real world drugs do in that it helps Jay’s customers hide from their real world problems. Blaine is faced with overcoming his own issues and helping Jay face his demons, all while contemplating if he should seek a future with Lisa. The story successfully wraps ups the threads of every character’s story, though not everyone receives a Walt Disney designed happy ending! Kinsey also does an excellent job with the Walt Disney World Resort setting. He does an excellent job of painting the scene, which is telling of his frequent visits to the Resort. My favorite detail was him discussing the small lizards one encounters while walking from place to place. And with this story set during Epcot’s 25th Anniversary, Kinsey takes us back to that version of the park complete with Mickey’s wand attached to Spaceship Earth. I admit I really enjoyed reading Blaine’s reactions to this version of Epcot after a long absence. Additionally, Blaine’s reaction to the removal of Horizons brought a smile to my own face. And of course, his reaction to the Imagination Pavilion and his guest comment card were moments I found hilarious. Who will enjoy Our Kingdom of Dust? I will admit it is outside of my general interests, being a realistic drama. The fact that it included the Walt Disney World Resort was the hook that brought me in. This was supported by the fact that I was happily surprised by Kinsey’s guidebook The Dark Side of Disney. Without these, I probably would have never picked up the book. I did find that the setting is very adult in nature and there are some graphic images especially around one death that I cannot shake and some may find disturbing. I think those who enjoyed the non-fiction books Mousetrapped and Cast Member Confidential would likely enjoy this fictional tale of broken people in a magical world. Our Kingdom of Dust with its adult situations and drug storyline may not be for every Disney fan. However, Kinsey’s writing is engaging and he draws you into a world of broken souls. If one is willing to give it a chance, especially with its low Kindle price, it can take you to another place for a few hours. And it might just remind you that you are not as broken as you think. 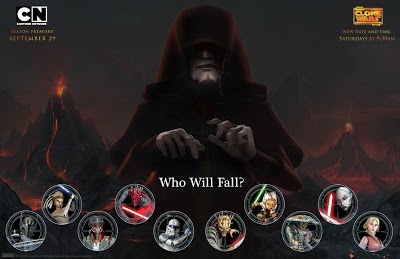 For the last few weeks, JimmyMac of RebelForce Radio has been warning us it could be Star Wars: The Clone Wars that could fall. I was a big Star Wars fan before Disney bought LucasFilm. Star Wars probably shaped my childhood just as much as Disney. And I was super excited when the purchase was announced as it seemed a no brainer to put Star Wars: The Clone Wars alongside Ultimate Spider-Man and The Avengers: The Earth's Mightiest Heroes is a super action animated programming block. And Star Wars: Detours would have been a fantastic fit next to Gravity Falls on the Disney Channel. Honestly, with a voice cast that includes Dee Bradley Baker, Corey Burton, and Jim Cummings has Disney written all over it! It just all seemed to be peanut butter and jelly, a prefect fit! But alas it does not seem to be. New stories are starting to break that Star Wars: The Clone Wars has been canceled. There could be official news soon! And honestly while there are season 6 stories in the pipeline and even season 5 episodes that have not seen the light, season 5 did end at a point that some may seen as natural. So here are our options. One we can sit around and know we did nothing as this Mousey program was put to rest before it could even reach a Disney network. Or we can politely let decision makers know that we value this Disney franchise and look forward to more. You can also call 708-320-1RFR and provide your words of support which will be compiled on a CD RebelForce Radio is sending to Disney leadership. We have seen a lot of changed in the last six months, but let's save Star Wars: The Clone Wars!